February 28 will mark the first time in history that a UFC card will feature females in both the main and co-main event. In the main event of the evening, Ronda Rousey will make the 6th defense of her world title against her most dangerous opponent to date in Muay Thai assassin Cat Zingano. 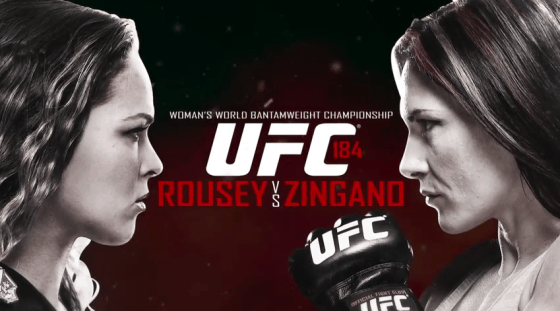 Rousey brings a perfect finishing rate in both her professional and amateur MMA career into the cage while Zingano has only let one of her fights go to the judges scorecards. And even though it resulted as a victory for her over one of the best female fighters in the world, current Invicta FC flyweight champion Barb Honchak, it still haunts her to this day. In the co-main event, boxing legend Holly Holm will look to put herself into title contention when she takes on the toughest test of her MMA career in Raquel Pennington. Sure, Pennington’s 5-4 record doesn’t exactly jump off at you on paper, but if you’ve seen her fight, well, you know just how tough she is. You cannot deny that Holm will have the advantage on the feet, she just better hope it stays there because Pennington’s choke game is above average to say the least. Three of the four women featured in the following video package will enter the cage undefeated at UFC 184. Who do you have leaving the cage perfect on February 28th? Feel free to sound off and share your opinion in our comments section below.